A dish that is simple to make yet very royal and mesmerizing. 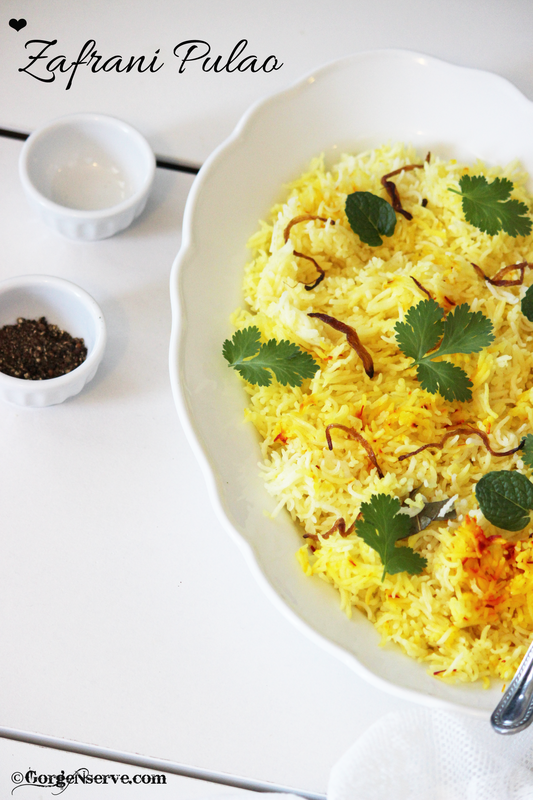 A recipe which is a mix of rich ingredients – Basmati rice cooked in a sweet and rich blend of Indian spices and nuts . 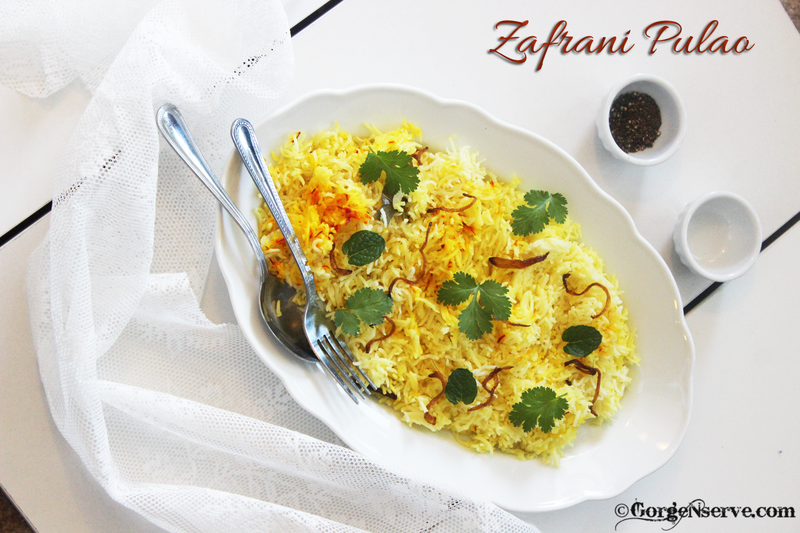 Zafrani Pulao is a stunningly flavorsome pulao recipe, with the essence of saffron. The name hence, Zafrani 🙂 This is simple, easy and can be cooked in very less time. I did not use much nuts today as I wanted a simple rice dish for my Chicken curry . But Generally nuts are used , so if you want you can also use nuts in it . In a heavy bottom pot, heat ghee add sahi jeera and let it splutter. Add cardamom, cloves, cinnamon, bay leaf , cashew, raisins and saute for 30 sec . Add rice , salt and mix well. Add water and let it boil. Once water starts boiling, give it a gentle stir. When water dries and rice is cooked to 90%, pour saffron soaked milk on the top, Cover and simmer until done. Once cooked, fluff up the rice very gently using fork. Garnish with fried onions and chopped coriander leaves. 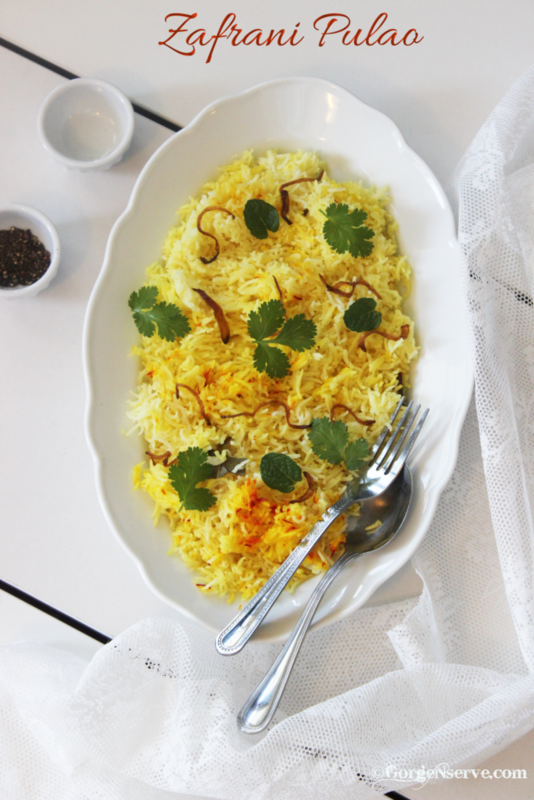 Our royal & delicious easy zafrani pulao is ready to be served. You can serve this with chicken curry or even raita.